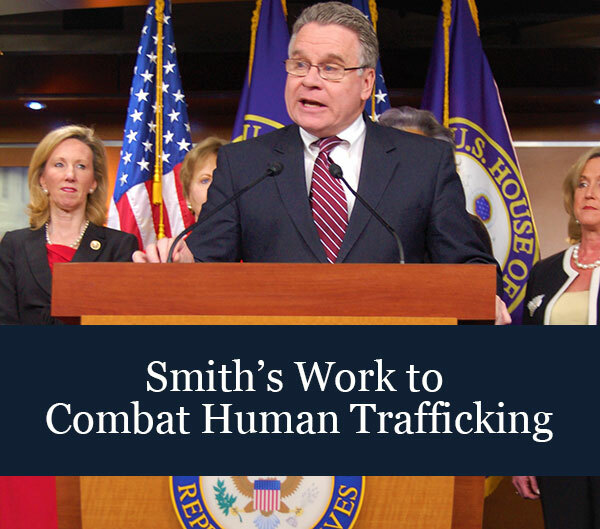 Congressman Smith speaks about the sacrifices of the World War II service members. Congressman Smith prepares to unveil the WWII statue. Officials, veterans and other participants cut the ribbon to open the permanent public display. Marine veteran Frank Richetti of Brick plays taps at the ceremony. Doves are released as part of the opening. 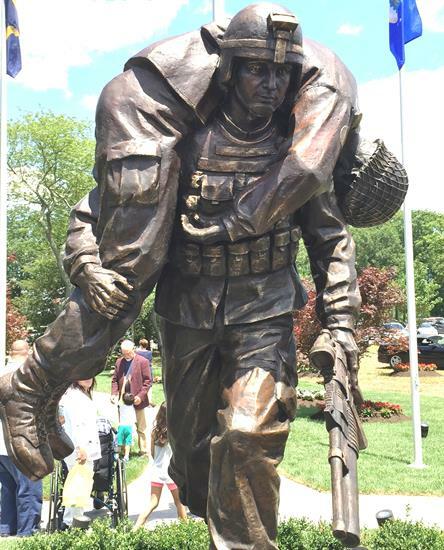 One of the Protectors of Freedom statues unveiled June 26, 2017. The new memorial officially opened June 26, 2017. The World War II statue Smith helped unveil. On June 26, 2017, multiple statues were unveiled, each rpresenting a seperate military conflict. Cong. Smith with sculptor Brian Hanlon of Toms River at the ribbon-cutting in Toms River, NJ in June 2026. Congressman Smith, right, speaks with attendee Marine Sgt. Jeffery Allen, and sculptor Brian Hanlon, on left after the ceremony. 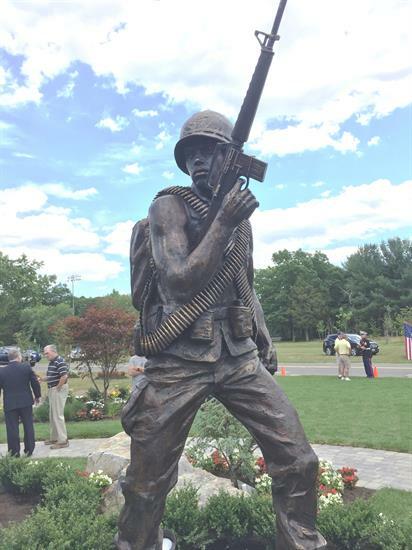 Thank you Jeremy Grunin and the Jay and Linda Grunin Foundation for enlisting the genius of sculptor Brian Hanlon to create six statues honoring U.S. servicemembers from several wars—men and women who endured and overcame crushing hardship to protect our freedoms. I was tasked with briefly recalling those who defeated the Nazis and Imperial Japan—and for a time the Fascists of Italy-- in World War II. Over 16 million U.S. servicemembers—560 thousand from New Jersey—answered the call to unconditionally defeat two of the most militarily powerful, hate-filled, racist and fanatical dictatorships the world has ever known. Unprovoked and an act of cowardly terrorism, the Japanese attack on Pearl Harbor rallied the nation in what President Franklin D. Roosevelt told Congress 75 years ago was the “date which will live in infamy”. He said, “There is no blinking at the fact that our people, our territory, and our interests are in grave danger. As we all know, the scope and size of the battles in both theatres of war were unprecedented with bombers and fighter aircraft, colossal aircraft carriers, submarines and other new weapons integrated into sophisticated tactics and strategies. The pioneering work done on radars and communications at Wall Township’s Camp Evans saved countless lives and helped win the war. Famous battles including Coral Sea, Midway, Iwo Jima, Okinawa, Tarawa, Bataan, Guadalcanal, Leyte Gulf, Luzon, Anzio, the Battle of the Bulge, D-Day and more demonstrated the tenacity, skill and extraordinary courage of our troops. More than 400,000 of those deployed however paid the ultimate sacrifice. Over 670,00 were wounded. There were more than 124,000 POWs and to this day, more than 73,000 MIAs—missing from the battlefield, downed aircraft, prisoner of war camps and ships that were sunk. This morning, the Asbury Park Press reported that one MIA, Earl R. Melton, a 24-year-old sailor from Lakewood stationed on the battleship Oklahoma at Pearl Harbor on December 7th was identified through DNA. He will be buried in Arlington with full military honors on June 28th. What was called Shell Shock in World War I was classified as Battle Fatigue or Combat Stress Reaction during World War II—however, many GIs suffered in silence both during and after the war. Only later would medical advances create therapies to more effectively diagnose and assist those suffering what is now called Post Traumatic Stress Disorder (PTSD). My dad Bernard was an Army infantryman who saw horrific combat in New Guinea and other islands in the Pacific including the Philippines. Like many others of his generation he rarely talked about the war but when he did, he told my older brothers and I that he and his friends had an indomitable spirit and faith in God that they would prevail no matter the cost, duration or sacrifice. During his long deployment, he wrote my mother many letters treasured by our family—some redacted by the sensors so that nothing was said about where he was and what he was doing. Astonishingly, he never once revealed an ounce of self-pity or regret. He and his buddies were absolutely determined to protect their families and the United States of America and liberate the world from unspeakable cruelty. They truly were the greatest generation. The six statues unveiled today are everyday reminders to pause and reflect and say a prayer of thanks for those who have sacrificed—and are sacrificing— so much for so many. World War II, the Korean War, Vietnam and the Middle East.